This article is presented by WEEKENDER, two days that will make your whole summer. If you’re headed out on a supported ride, you want to ensure you’ve got what you need for the day. If it’s a multi-day ride, that gets tricky. Even though the ride is supported, you can’t bring it all. That’s why we love Cycle Oregon’s packing list. It has just the right balance of essentials and a few of the little things that go a long way toward comfort and fun. You can check out the list here. Being light weight is key. So is going without. If you brought the entire house. that’s no fun; you may as well have stayed home! For heavy items, look for lighter weight alternatives. Standard towels take up a significant amount of space. Flour sack towels, commonly used in the kitchen, as one of the best towel options out there. They pack small, dry quickly and are ultra absorbent. We think they’re worlds better than pack towels. Most people will want to bring two, though it’s reasonable to only bring one, especially if you have short hair. If you need to bring your own dishwear, where can you combo up? A stainless steel pint glass works for coffee, camp drinks and beer as it washes out clean without the residue of other beverages. Pop a beer cozy on that sucker and you have “One Cup to Rule them All” as your hand is protected from coffee’s heat transfer. Chat with your traveling companions. You’ll probably find that there are a few items you can all share, such as a portable speaker or other such communal item. Think about what you’re truly going to use, and what can be left behind. It’s fun to play the game of “how minimal can I go?” But it’s also fun to add in surprises that will delight your fellow travelers, such as festive hanging camp lights or homemade cookies. Cinch sacks are a low-cost item that allows you to bundle similar items, socks and undies in one bag, t-shirts and shorts in another, then squeeze out all the extra air. This keeps your luggage compact and organized – a big win. Be sure to buy your cinch sacks in different colors so you can easily keep them organized. If you find yourself venturing out on such journeys a few times a year, it’s worth investing in the lightweight, durable gear that will make your adventure more compact and rewarding. Gear is a huge, complex issue with plenty of subjective facets. Spend time talk with friends and doing your own personal research to find what works best for you. 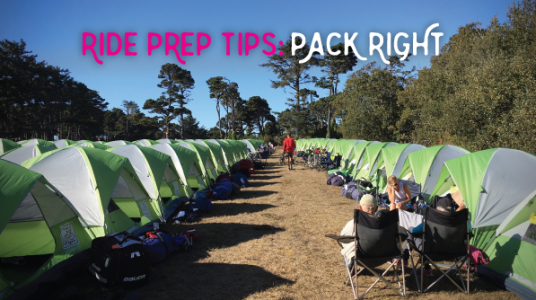 How do You Pack Right and Light? What are your favorite packing tricks? WEEKENDER a ride by Cycle Oregon, is July 7-9, 2017. Bring your friends. Bring your neighbors. Bring your family. Bring your bikes. Everyone is welcome for Cycle Oregon’s two-day bike bash! Linfield College campus is home base for a weekend of great rides, live tunes, and activities galore. Choose from a short, medium or long route through wine country, then camp under the stars or crash in the dorms. It’s two-wheeled fun for everyone!